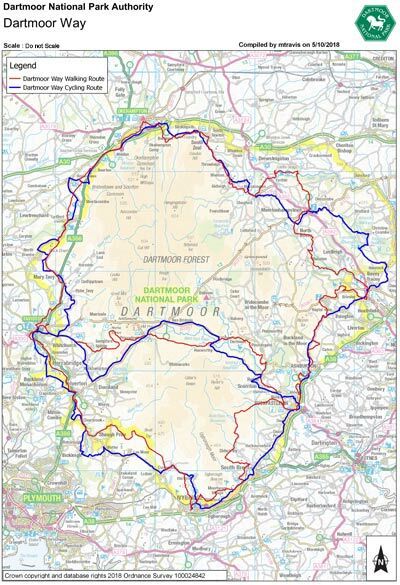 The Dartmoor Way Walking Route is a 100 mile-long circular route which winds its way around the natural beauty of Dartmoor National Park, linking hamlets, villages and towns along its length. Most of the route is on a separate alignment (footpaths) to that of the cycling route (minor roads). This recreational route takes walkers through the varying landscape surrounding the High Moor, visiting attractive and interesting locations which offer a wide choice of places to eat, drink and stay for the night. The well-signed Dartmoor Way Walking Route will follow quiet Devon footpaths and lanes, we plan to complete the signing by the end of 2019. The Dartmoor Way offers many possibilities for a break away - from a day trip or weekend, to a full 5 - 7 day holiday. From winding, secret, Devon footpaths, to airy moorland paths with panoramic views, this route has interest packed into every mile. Walkers will discover full days of beautiful scenery, wonderful places to stay a while, and great places to explore. This is a Ramblers/Dartmoor National Park Project. We will acknowledge the great contribution of our funders when this site is amended to launch the completed route.